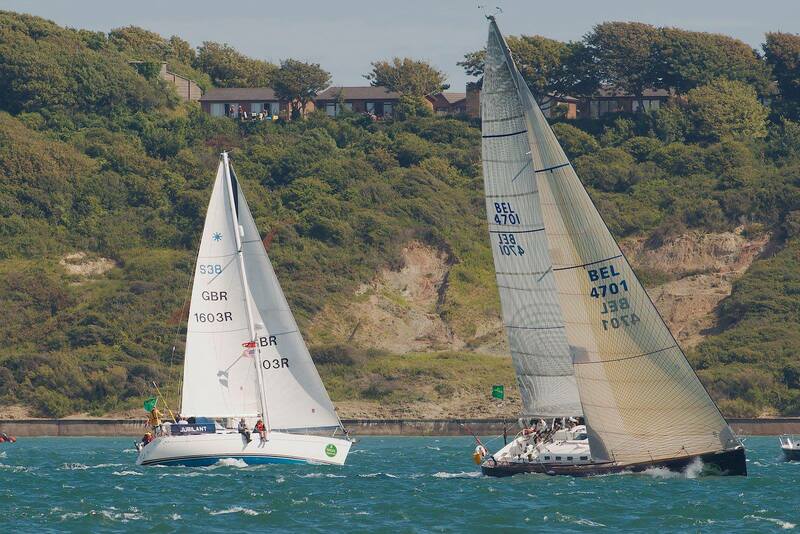 My 2013 Rolex Fastnet Yacht Race By N Gilchrist. 2nd Watch leader onboard Jubilant. Martin – Skipper. Tony & Jerry. Nigel – Watch leader. 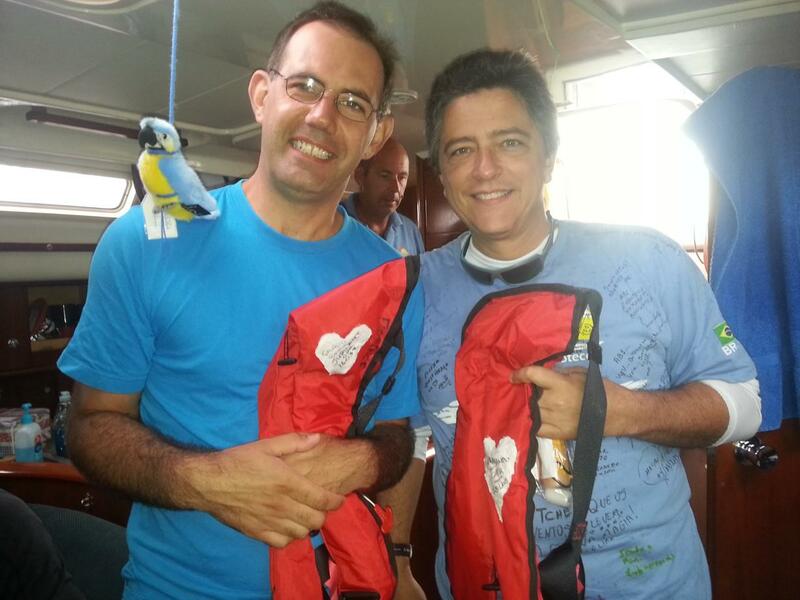 Armando & Gilberto ( navigator ). Sophie – Cook and floater crew. Sunday 11th August Race Day. The crew are ready for the biggest race of their lives after training in sea survival, qualifying over 300 nm and flying in from around the globe. Weather forecast for the next 5 days looks quite settled with SW to NW breezes from force 2 to 5s. 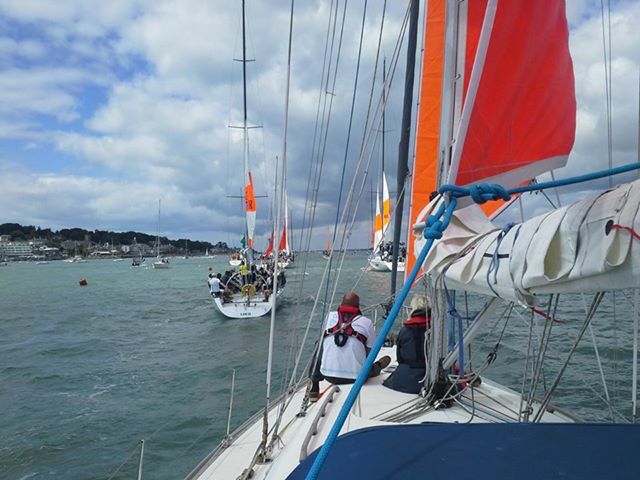 We leave Port Solent on an overcast morning which promises to brighten up near the start time of 12.30 for IRC4. Jubilant approaches the check gate with storm sails up and call in the number of crew. The crew & the atmosphere of the event is buzzing. We have made it to the start of Britain’s toughest yacht race. Esimit Europa 2 at the identity gate with Jubilant. Europa 2 took mono hull line honours. The gun fires, Jubilant is some way back from the start and takes about 15 minutes to cross the line, not a particularly good start but we had started and safely. A light WSW breeze means the fleet has to tack out of the Solent. Just 140 minutes into the race we spot 2 competitors who have run aground on the North shore, looks like they will have to retire, very hard luck. As we approach the west end of the Solent the big yachts start to pass us. We were on a starboard tack when a canting keel yacht approached us on port, he had to bear away to miss us, as he passed our stern I watched the canted keel pass under Jubilants rudder, wow that was a close one. What a sight to see all these super fast yachts sailing past us. 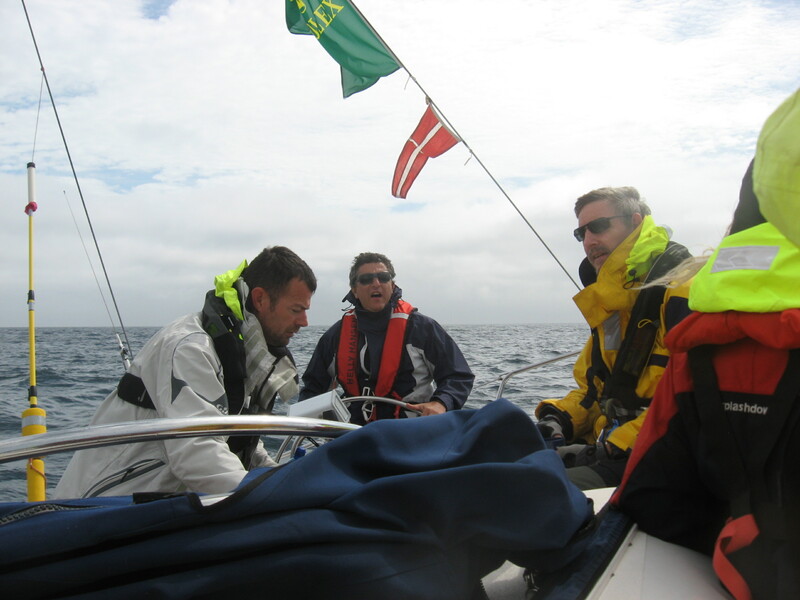 The day continued tacking out towards Lands end in a light West breeze. Armando Gilberto and myself have the midnight to 4 am shift coming up. Midnight see’s Jubilant 12 nm South of Portland Bill. Woken just before midnight eager to get on deck. Very light wind almost becalmed and very clear night with many meteors streaking across the sky. Jubilant’s speed is 2 knots over the ground, the wind starts to fill to 10kn WNW. 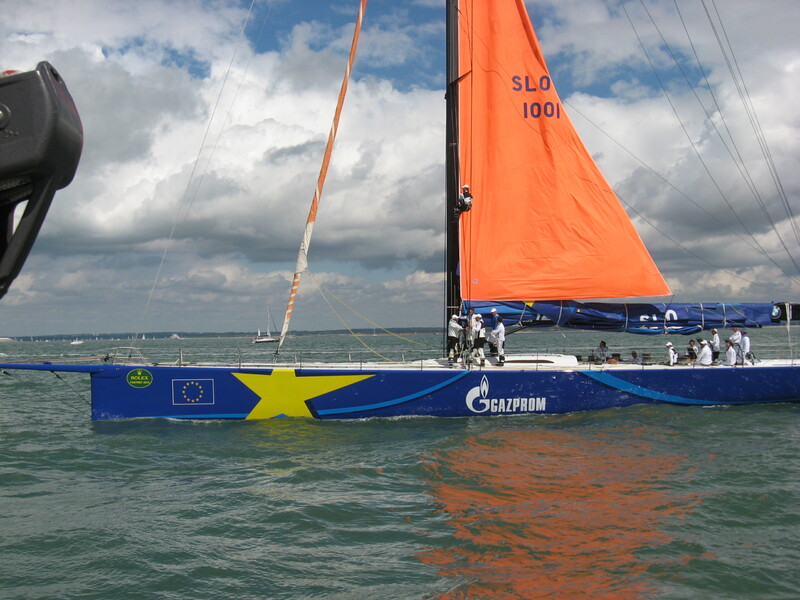 By 3 am J is sailing at 5 knots sog ( speed over ground) heading SW. Its amazing to be here sailing in the Fastnet race. I can see Jerry moving around below deck, must be near 4 am, time passes quickly when your having the time of your life. 8am, 2 hours sleep but very ready to start our shift. A delicious breakfast served by Sophie starts the day. Wind still light 10kn now NW. Forecasters are saying the wind will back from NW to SW later. This is what we need. Frustratingly slow progress especially when the tide is against us, but not a lot we can do about it but enjoy the sun. Jerry’s up and about, its midday already. We are 15 nm South of Dartmouth at the hand over, wind 14 knots NW. Everyday at 4 pm the on shift has a 2 hour watch then next shift has 2 hour watch, then back to 4 hours, to allow each shift to see sunset and sunrise. – Ahh thought shift change was 2pm !! Oh well. 14 knot NW breeze with tide in favour J is sailing at 7.5 kn WSW. Great dinner served, The food you receive can make a big difference to the way you perform, we are very lucky to have Sophie. 6pm see’s J about 50nm ESE of Lands end. So this means I’ve got 2 hours off now ??? With the forecast backing to SW soon Gilberto suggests we head into the shift at fastest possible speed, we adjust course and pick up speed heading SW into the coming shift. What Jerry’s up already that can’t be 4 hours!! By midnight we are 20 nm South of the Lizard. (The most southerly point of mainland Great Britain ). I’m finding it hard to sleep, but I don’t feel tired. Wind 11 knot NW the wind must shift soon. We are going to pass between the Scilly’s and Landsend. First boats arrive at the finish, Spindrift II & Banque Populaire the big multi hulls. Jerry and Martin are up. I guess its off time. We hand over watch hoping the wind will back very soon. Midday. No sleep, I cannot sleep in daylight hours no matter how much I try. Wind has dropped off to almost nothing again. I look over the back of J an see we are trailing something, rope or weed. A quick hove to and see if it drops off. No, ok back the sails and let the boat reverse a bit. Ok still there. Next thing we see is Armando in his Speedo’s ready to jump over the side. Good job Armando, weed cleared. Finally at around 2pm the wind backs to WSW, only 12 hours later than predicted. First pod of dolphins spotted. About 20-30 of them, riding the bow and jumping all around. Awesome. By 4pm J is about 5nm North of the Scilly’s . Martin, Tony and Jerry are up for their watch. 6pm ahh got it wrong again!!! 2 hour shift. No sleep. J is on course for the Fastnet rock now with a good forecast of force 4-5 SW.
Actual Wind 7 knots SW. We are in the Western approaches now we must get more wind !! Its just before 8pm, I know because Jerry’s up and about. The breeze is starting to build a little. 15 knots. SW, that’s better. J is sailing well in 15 – 18 knot SW breeze. By now we had found out that Armando and Gilberto are not keen on helming through the night hours, well this suits me perfectly as I love to helm at night. This particular night while on the helm I looked back at our wake which was glowing with phosphorescence, I saw what looked at first like a torpedo heading for us from astern, then I realized it was a dolphin lit up by the microbes in the water, another awesome sight, a dolphin glowing green chasing us, what a pleasure. You must be kidding me, Jerry’s up already, 4am, about 80 nm SE of the Fastnet rock. J’s sog 6.5 knots heading NW. Wind 15 – 20 knot WSW. We will round the Fastnet some time this evening, Perfect time for Sophie’s Roast Lamb dinner, We are all looking forward to that. A good watch with good pace and 2 more visiting pods of dolphins. Everyone is in good spirits and having fun, the sun is shining and we are approaching the famous rock. Midday. I know im not going to sleep so I will relax on the windward rail. 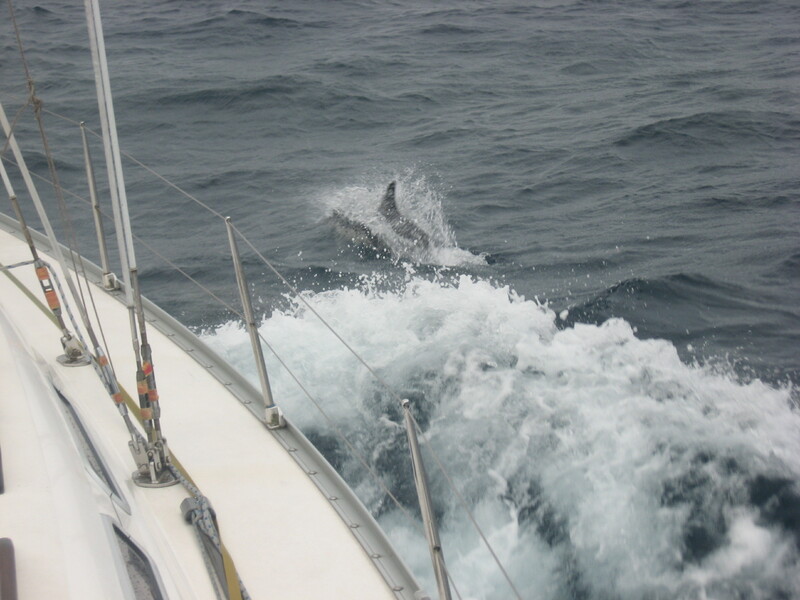 Jerry on the helm, Tony Sophie Martin and Gilberto join me, we have more dolphins playing along side us. Im starting to feel right at home, and Im loving it. Just 15 nm to Fastnet. Wind 20knots SW.
Forecast, Force 5-6 SW – Perfect!! We should reach the rock in about 3 – 4 hours. The breeze starts to ease a little and the mist starts to build. I hope we can see the light house after 370 miles. 6pm Martins 2 hour watch. We will pass the Fastnet during Martins watch. No point in resting we want to see the rock. 7.30pm, Its foggy and light wind. We will have to tack in close to see the lighthouse. 1 nm away no sign of it !!! 7.54pm 0.5 nm there it is, we have reached the Fastnet lighthouse. I and I’m sure I can speak for the rest of the crew feel very proud and chuffed to have made it this far. Wild days Rum all round, Relayed all the way from YachtYakka’s homeland of NZ. 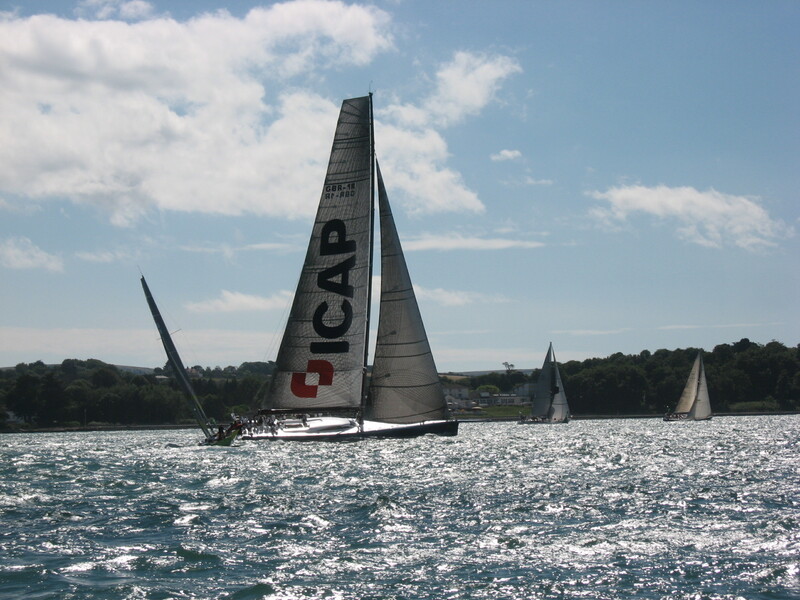 We toast to past, present and future Fastnet sailors, SOL, the rock and Jubilant. Sophie worked hard to prepare a wonderful Roast Lamb while J was healing at 15 – 20 degrees in a lumpy sea, Hats off Sophie, I could not have done that. Then to follow, home made ice-cream all made with Mr D’s Thermal cookers. Yummy. This watch promises to be a good one with a forecast of SW 5 – 6 increasing to 7 later. By the time the 7 gets here we will be well South of it though. An overcast night very mild but jet black, I cannot see the bow or the waves, the wind increases to 25 knots SW, Jubilant is flying along at 8 – 10 knots, surfing on waves. I feel the stern lift, I counter steer, I hear the waves breaking, we’re surfing along at over 10 knots, I LOVE THIS, The natural high is an amazing feeling. This is where I want to be. Wind and spray on my face great company and awesome sailing. No way I don’t believe it, it cannot be bunk time already, although my arms are aching quite a bit. Jerry, I can set my watch by you, never late on watch, bravo mate. We hand over watch blasting our way back towards the Scilly’s. I had a little moment this morning when I woke around 3am. I awoke in total darkness confused. I didn’t know where I was, or what I was doing there. I needed to go to the loo. How do I get out of where I am ? Ouch hit my head on something. What’s going on, ahh Im sailing but how do I get out of here. I Feel around but can’t find a way out. Ah there’s a person next to me. Im in the back cabin on Jubilant in the Fastnet race quick get to the heads. For your information I did make the toilet in time JUST. We are about 110 nm from the Scilly’s sailing fast, looks like we may get to Bishops rock by evening. I thought a lot on this leg of the race about the 79 Fastnet especially when we were around the area of the storm, it was a strange and quite emotional feeling, also at this point it seemed odd to have just sailed all the way to Ireland and head back without touching land. 8am Martins watch up on deck . Wind 18 knots SW. Jubilant’s sog 9 knots heading SE. Wind 18 knots SW- Sog 8 knots heading SE. This is a good 24 hour run, we are catching quite a few other yachts. Another great days sailing in the Celtic sea. Its good to have other yachts around us, it keeps you sailing to your best ability. Jerry’s first up on deck. Short shift time. Now the biggest pod of dolphins escorts Jubilant. Over a hundred of them, they ride the waves and bow and leap all around us for over half an hour. Totally amazing. It was around this point we had a water supply failure, no more water from the storage tank, although it was still half full, only bottled water left. Not important now we have enough bottles. After we finished the race we found the filter to be blocked. Im getting lost with the short shift, it throws me a bit. 8pm. We pass Bishops Rock lighthouse, That’s a 24 hour run of 170 nm. A great run for Jubilant and crew. Round Fastnet lighthouse to round Bishops rock lighthouse in 24 hours. Great job. Just over 80 nm to finish. We have been sailing hard for the past few days within sight of several yachts, Baloo, Ocean Tango, Gentle Zephyr, Krackpot & Liquid Edge being the closest, This night was the closest sailing of the whole race for me. Liquid Edge had been catching us slowly from since the Scilly’s, they caught us at about 8 nm South of Landsend, for the next 20nm we were a stones through apart, so close I could see his navigation instruments in the dark and hear the crew talking, we were stealing his wind so I had to stay close to them. Breath taking sailing, they just passed us at 4am our off time. My arms feel like lead now, need rest, a welcome sight seeing Jerry up below. During the next 4 hours Martins watch set the spinnaker and passed Liquid Edge again. WD guys. A good rest period for me. Woke a bit dazed wondering what was going on, something tapped me on the side of my face, I looked round and see RC the ships parrot looking at me. I laughed and then realised where I was. Wind 12 knots SW and dropping. The finish is in sight but the wind is dropping as we approach the mainland. Liquid Edge and Baloo are both behind us and we are putting distance between us. As we enter Plymouth sound the wind shifts all over the place, from spinnaker to tight hauled into the wind within 2 minutes. At 11.30 am after 119 hours, with a enormous cheer Jubilant cross the finish. More Wild Days Rum to celebrate our achievement. Fantastic guys we did it. I just wish my Dad was here to see it. Thanks to Armando, Gilberto, Sophie, Tony & Jerry. A special thanks to Joanne who has helped us all the way. 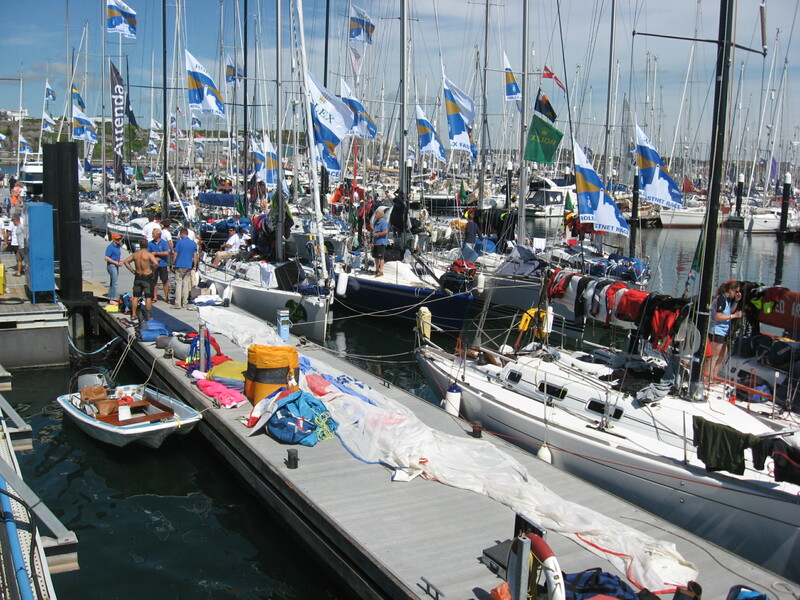 Without all these people I or we would not have Just finished the 2013 Rolex Fastnet Race. I would also like to thank Dave & Mr D’s Thermal cooker’s for supplying us with the perfect cooking kit. I’m proud of everyone involved in this campaign. I would happily sail with any of you any time and hope I will. Jubilant and crew finished in 257th Ahead of Monster Projects open 70 and both maxi 100’s ICAP Leopard and Esimit Europa 2 on corrected time. & Finished 67th in IRC 4. Very happy with that result. The 3 day sail back to Port Solent with Tony and Sophie was truly a wonderful sail in glorious sun shine and perfect wind. Thanks guys. My sleeping pattern was not a problem to me. When its daylight my body says no sleep. When I’m having the time of my life I don’t want to miss anything, but I rest for the full 3 – 4 hours, which seems to be enough as long as I get 2 or 3 hours sleep in 24h. It was hard trying to sleep with the hull pounding into the waves while in the Celtic sea, so only 1-2 hours then, but enough with a good diet. This also allows you to enjoy the experience that much more. Thanks guys. Since my dad passed away in January their was no one to listen to my story with the enthusiasum only a father could have. So I was very happy to share my race with anyone who wanted to know.